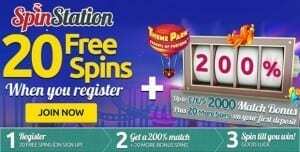 Spin Station Review - 325% Cash Match Bonus & 100 Spins! Spin Station jumps onto your screen, with an eye catching theme and the hottest slot and casino games. Of course if Phone Bill Casino are telling you about them, then there’s pay by phone bill in there too. Find out why this site offers the perfect blend of games and bonuses, which should satisfy any type of player. It’s all about the games on Spin Station and as such they provide an impressive range which includes live casino, blackjack, roulette, table games, poker, scratch cards, virtual and slots. If that’s not enough, they even offer a few bingo games for the dauber fans out there. Over 50 of these incredible games can be accessed on mobile devices, including Android, iPhone and tablets. If you’ve yet to make the move to mobile gaming, then this maybe the time to try it. You’ll enjoy the same standard of graphics and sound that you’d find on your desktop and you can play whenever you choose to. 3rd deposit, 75% cash match bonus up to £500 and 30 spins on Theme Park. Spin Station on Tour – Playing on Spin Station brings you more than the enjoyment of gaming, because as you wager you’ll earn station points. For those regulars who reach 1,000 points, you’ll receive entry into the monthly prize draw to be in with the chance of winning a Mercedes-Benz SLC. The draw will occur at the end of the month and you’ll be notified if you’re a winner. Private Tournaments – If you’ve funded your account within the week, then you’ll have the opportunity to play in their private tournament. Twenty lucky players will receive an email confirming that they have won and what their prize is. Multiple Loyalty Points – Each week a slot game chosen by Spin Station, will be confirmed as their slot of the week. The identity of the game will be sent via email and you can earn additional loyalty points as you play. Spin Station provide a VIP Scheme, so they can treat their loyal players to a few extras. The programme is tailored to your gaming habits and considers factors such as the types of games you play, or the amount of credit you deposit. Should you need any support from a Spin Station representative, then contact them using the live chat option or by email. They accept the usual Credit and Debit Cards, Neteller, Paysafe Card, Giropay, Skrill and Dotpay. We’re sure you’ve noticed that we haven’t mentioned mobile billing, but did you know that Neteller now accept Boku? There is a small transaction fee, but by using Boku you’re enhancing your financial security and increasing your choice of online casinos. Check out our article on Neteller accepting Boku payments, which also provides a list of sites. With so much on offer, we wouldn’t be surprised if you’ve already left us to register. If not then head over to Spin Station and claim those welcome bonuses.